Have you ever wanted to pursue something just for yourself? 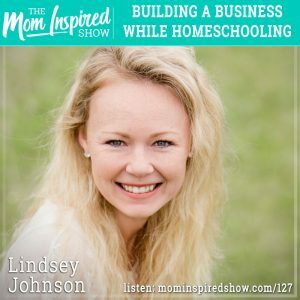 Today we have Lindsey Johnson on the show and we talk all about her starting her business, being a mom of 3 and homeschooling. Lindsey shares with us how she grew her business slowly but steadily and that she preferred it that way vs. growing it super fast. We chat about her schedule and what that looks like in a week with homeschooling and running a business and how its key to get the most important tasks done first. One tip that she gave us that really stood out to me is when she said that if you want to start a business then you have to offer a solution to a problem and that is what you have to remember in order to be successful in what you are doing. Hear what she says about this topic and more on the podcast.